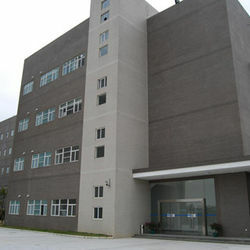 Wuxi Guangqiang Bearing Trade Co., Ltd. 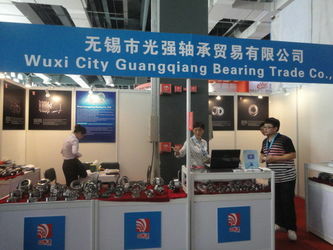 Established in 1989, Wuxi Guangqiang Bearing Trade Co.,Ltd works hard in researching and manufacturing high quality bearings and rely on it's advantages of strong technologies, advanced equipment, professional technical team, quality production and reasonable prices has gain a broad recognitiongain and won the widely support and trust by customers in bearing fields. For decades, the company established and completed the quality management system of scientific standardization in line with international standards. 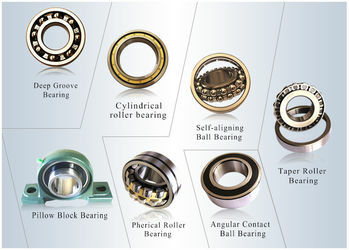 In 2005 they won the title of Chinese famous brand ranging from tapered roller bearings, cylindrical roller bearings, spherical roller bearings, thrust ball bearing, angular contact ball bearings, deep groove ball bearings and various non-standard bearings etc. Our products are widely used in auto industries, construction machinery industries, electric power industries, pharmaceutical field, mining machinery, printing industries, highway engineering machinery, steel industires, textile machine industries and so on. Capable of solving all your bearing issues with its first-class professional advisers and skilled engineers, Wuxi Guangqiang Bearing Trade Co.,Ltd embrace any inquiry, negotiation, cooperation from new and old friends at any time. 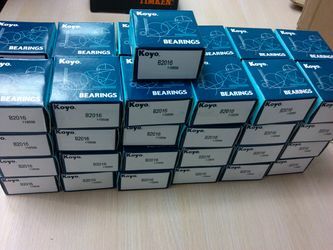 GQZ company seels high-quality bearings of top-ranking brands.We have over 10,000 different numbers of bearings in stock,all of original packages and directly imported from Germany,Japan,Ameirica,Korea etc. 1. Established in 1989.At first our factory producing full range of taper roller bearings and sells in Mainland. 2. 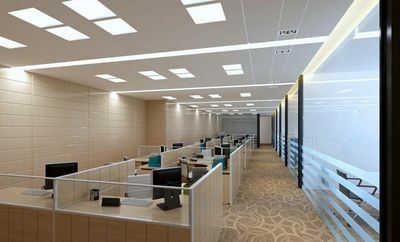 In 2004 year,foreign business apartment creatured,start to do bearing business around the world. 3. In 2005, praised as Wuxi AAA Level Enterprise of ''Honouring Contracts and Keeping Promise" by the Wuxi City Government. 4. 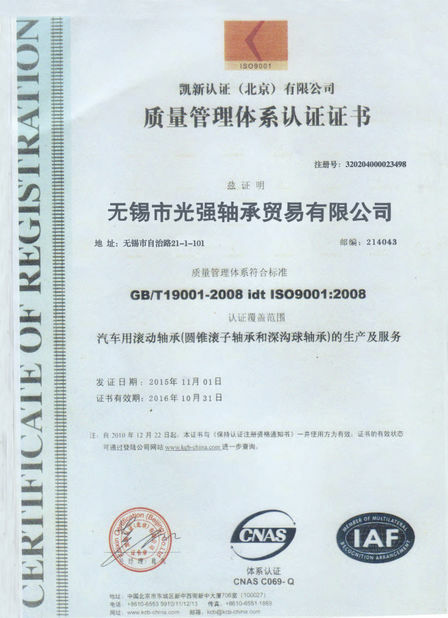 In 2006, gained ISO 9001:2000 Certification. 5.In 2007,We created of GQZ brand.Annual production capacity of 100 million sets. 6. In,2008, Was awarded the honorary title of "WuxiCity AAA credit enterprises"
7.In 2009,We have a long cooperation with world famous bearing company FAG, KOYO, TIMKEN, NSK and so on. 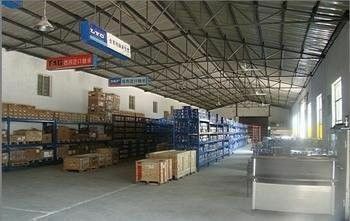 8.2010,We owned two factories:One is in Shandong,other one is in Wuxi. 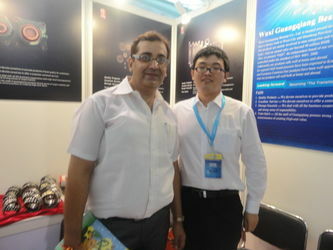 9.2012,Owning a big store in Shanghai for international business. 10.2013,our company organize Wuxi bearing association to expand range of busienss including auotomoble bearing. 11.2015,we owned a member of World wide trade B2B. A company's success is reliant on each staff's participation and dedication.We make efforts to provide excellent products and services to our customers.Morality,honest and gratitude constitute our company cultures. "quality first, reputation first, service first". Quality Products: We devote ourselves to provide products of best quality for customers. Excellent Service: We devote ourselves to offer a customer -centered service. Manage Sincerely: We deal with all the business cooperation with high-level transparency and strong sense of responsibility. 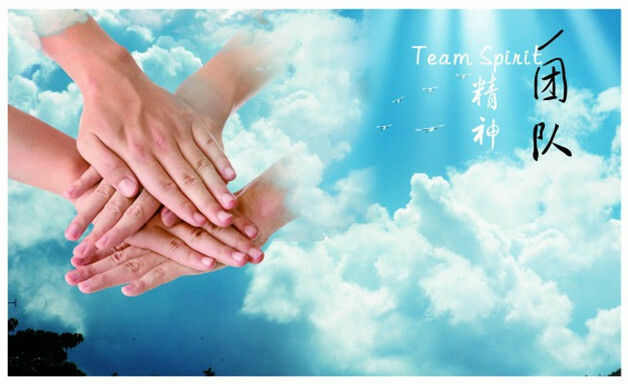 Team spirit: All the staff of guangqiang possess strng sense of responsibility and the consciouseness of crating High-end value. Our professional selling staff and advanced ERR management system make it possible for us to follow customers' regular needs and prepare our stock to meet their urgent needs. Our senior bearing application engineers have abundant experience in choosing target bearings as well as installing bearing to relevant machines. Our excellent file work and sufficient specialized knowledge enable us to give professional advice on choosing target bearing number to our customers.